With our cold winter , it is a good idea to find out how to avoid condensation at the bottom of the windows in your home or place of business. Not only will that allow you to see the street better – it will also prevent the water running down the windows and into the room, which can cause even greater problems, such as fungus and mould. Because it’s always useful to know what the ambient humidity of a house is (it should never surpass the 50% mark), installing a hygrometer will allow you to monitor and control the level of humidity in your building better. Of course, it is not easy to know the rate without a device, which is why installing one is a great start to fixing the problem. If there is a recurring humidity problem, it’s a good idea to also install a dehumidifier to reduce the level of humidity in the air. If the humidity levels in your home tend to be high, try to limit or control those activities that create additional humidity in the air. For example, when showering, do not forget to turn on the air circulation fan. The same goes for the ventilation in the kitchen while cooking food. 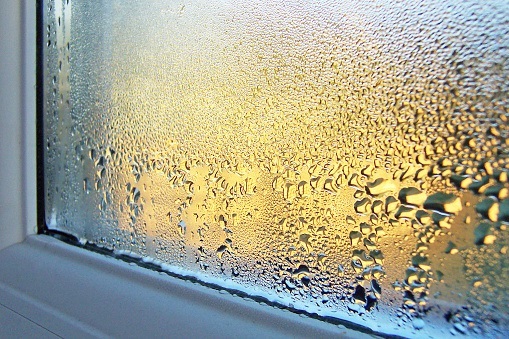 When there is little air circulation around windows, you risk high levels of condensation. To remedy the problem, make sure that the bug screens, curtains, and other decorative elements do not block the window panes, which would prevent air circulation. For example, leave the curtains open while heating the room in the evening. This simple trick can make all the difference in the world. Humidity results from contact of moist air with cold air, as we can observe on the windows. It is important that the tumble dryer, one of the home appliances producing extra heat in the house, is connected to the air duct, so that it can expel hot air outside and not inside. This would prevent the formation of condensation on the laundry room windows.